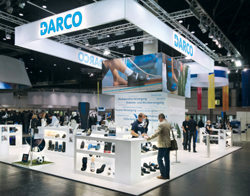 DARCO Europe Product Demonstration Videos - The handling of the aids is conveyed in practical step-by-step instructions. We are pleased to present modern educational videos. The handling of the aids is conveyed in practical step-by-step instructions. This video clip shows step by step how to apply the Relief Insert® Walker to the patient. Find here the film about the Relief Insert® Walker and all further information. Find here the film about the PegContour® Insole and all further information. This video provides you with information about all available Heelift® models, how to fit them and the options for customization. You can find the video about Heelift® Suspension Boots and more detailed information about these products here. This video includes all features and customization options of the PegAssist® Insole. You can find the video about the PegAssist® Insole and more detailed information about this product here. The features and customization options of the Puzzle Insole® are explained in this clip. You can find the video about the Puzzle Insole® Modular Insole and more detailed information about this product here. An educational video about the dorsal night splint from DARCO. All features and characteristics of the Body Armor® Night Splint as well as its application are explained in this. You can find the video about the Body Armor® Night Splint and more detailed information about this product here. You can see the functions and options of the TAS® (Toe Alignment Splint) in this video. Correct fitting is also shown. You can find the video about the TAS® (Toe Alignment Splint) and more detailed information about this product here. The features of the OrthoWedge from DARCO and a gait analysis on "How do I walk properly in a forefoot off-loading shoe?" are explained in this video. You can find the video on "How do I walk properly in a forefront off-loading shoe?" and more detailed information about the OrthoWedge here. 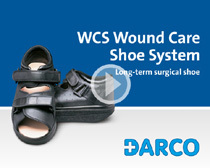 This video provides you with information about the WCS® Wound Care Shoe for diabetic patients and how to fit it and the options for customization. You can find the video about WCS® Wound Care Shoe and more detailed information about these products here. This video demonstrates how to apply the DARCO Posterior Splint Splinting System. You can find the video and more detailed information about these products here.